In this, one of the most influential works of the post-Hegelian era, Feuerbach captures the synthesis that emerges from the dialectical process of a transcending Godhead and the rational and material world. In understanding the true nature of what it means to be fully human, Feuerbach contends that we come face to face with the essence of Christian theology: human beings investing ordinary concepts with divine meaning and significance. The true danger to humanity occurs when theology is given the force of dogma and doctrine. Losing sight of its anthropological underpinnings and dependence upon or emergence from human nature, it then acquires an existence separate from that of humankind. Feuerbach leaves nothing untouched: miracles, the Trinity, Creation, prayer, resurrection, immortality, faith and much more. This classic humanist analysis of Christianity was translated into English by renowned novelist George Eliot. Ludwig Feuerbach (1804-1872) was a highly respected nineteenth-century philosopher who focused on the study of post-Hegelian philosophy, idealism, naturalism, materialism, and positivism. 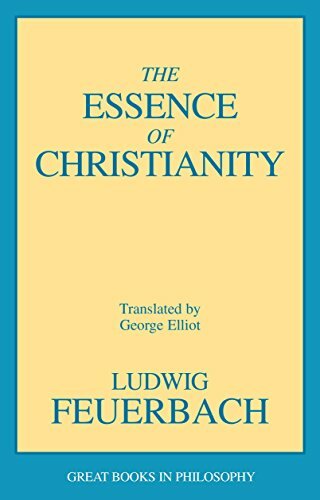 Feuerbach’s book, The Essence of Christianity, is noted as an influential atheist text, and helped inspire the work of Karl Marx and Friedrich Engels. Feuerbach was educated at the University of Berlin.